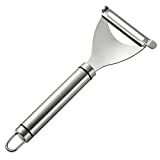 SHARP STAINLESS STEEL SWIVEL BLADES: No shape is an issue for this kitchen utensil. Its swivel slicers can go around any veg or food. 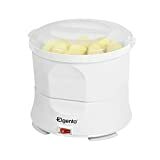 BUILT IN POTATO EYE REMOVER: This essential gadget for the kitchen helps to speed up the preparation and cleaning of any food. EASY CLEAN BLADE: The MV Essentials potato peelers are made with high quality material to ensure durability and avoid any rust from washing. Perfectly dishwasher safe. 100% SATISFACTION GUARANTEE: We aim for our customers satisfaction, therefore we Guarantee 30 days full refunds by the manufacturer for any inconvenience. 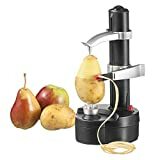 Peels potatoes,fruits and vegetables instantly at the push of a button. SUPER SHARP: Vertical stainless-steel blade peels smooth skinned fruits and vegetables quickly and easily. Swivel blade designed for less waste. NON-SLIP: Plastic handle has indented curves to fit fingers. Comfortable and easy grip. EASY STORAGE: Hole in handle for hanging storage. DISHWASHER SAFE: After use, just slip the DOTO peeler into the diswasher for easy cleanup. LIFETIME WARRANTY: 100% Money-Back if you're not satisfied without questions. 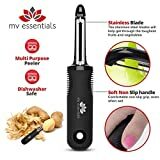 Lantana 3 in 1 Peeler - Multifunction Speed Y Peeler with Julienne Slicer. 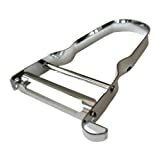 Great for Peeling Potato, Carrots and All Types of Vegetable and Fruit. Suitable for Right or Left Handed Users. 3 IN 1 MULTI-FUNCTION DESIGN - for Brilliant Results every time. A true all-purpose peeler, this 3 in 1 Peeler will easily handle any peeling task in your kitchen. Designed to peel all kinds of vegetables and fruit. SHARP STAINLESS STEEL BLADES - 1 x straight edged, 1 x micro-serated and 1 x Julienne slicer. Easily handles the toughest Vegetable skins, the most delicate of fruits and everything in between. 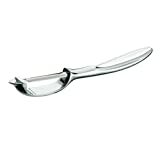 ERGONOMIC HANDLE - perfectly balanced to fit hands of all sizes, for fast, comfortable peeling. A non-slip rubber-feel silicone is embedded into the handle to give superior grip and brilliant control while peeling. Suitable for both right and left-handed users. STYLISH & DURABLE DESIGN - designed for toughness and superb functionality, but also to look great in any kitchen. TRY RISK FREE - Total Satisfaction Guaranteed or Your Money Back.